Apr. 11 (NBD) -- "Mom, how many clothes left do I have to put on today?" 8-year-old Doudou (alias) asked her mom with a drowsy look. Waking up at 7 o'clock this morning, Doudou has been photo shooting for 6 hours and feels too weary to go on with her work as a child model. On Monday (April 8), a video trended on China's Twitter-like social platform Weibo and still dominates the trending list by Wednesday. In the video, a little girl wearing summer costume was reprimanded by a woman for her wrong posing. A merchant identified the girl in the video as Niuniu, a famous child model in Hangzhou, Zhejiang province, and the woman turned out to be her mother. With child modeling needed to boost kids wear sales at one end and protection of children's rights and welfare at the other end, how to strike a balance? "I believe a scientific and effective legal system is the key, including supervision over child-modeling firms and clear stipulation of workload and working hours for child models", said He Zheng, partner of Solton & Partners law firm in Chongqing, in an interview with NBD. The video sparked a furore and extensive criticism among Chinese netizens. Under the pressure of public criticism, Niuniu's mother apologized for her bad temper and explained that the family does not rely on Niuniu's earnings. "Her father has a job. Having been working for a whole day, I feel sorry that I was unable to tame my temper at that time". The apology triggered a fresh round of discussions among Weibo users. "Several days ago, I took my daughter to shop in IKEA. I saw a child model wearing T-shirts, shorts and sunglasses there and a woman taking photos of him. What upsets me most is that the child wore too little on that cool day. When we got there, they were shooting. Even after we left, the woman was still photographing that poor kid", a Weibo user left a comment on the video. Another user also expressed her indignation and sympathy. "I used to work for an online shop on Taobao. The merchant would hire child models to advertise their kids wear and wants to photograph more sets of clothes in an hour, as the merchant is charged on hourly basis. Sometimes the kid needs to change more than ten sets in an hour. It is a tremendously heavy burden for a kid", the user said. Is child modeling a legitimate business in China? "Based on China's legislation, there is currently no direct legal requirement prohibiting guardians from engaging minors into economic activities", He Zheng said. The Law of the People's Republic of China on the Protection of Minors stipulates that no institutions or individuals are allowed to employ minors under the age of 16. But there are some exceptions. Specific to child modeling industry, "Provisions on the Prohibition of Using Child Labor stipulates that it is legal for arts and sporting institutions to employ professional literary and art workers and athletes under 16 years of age", He Zheng said to NBD. In addition, it is notable that "employment" and "cooperation" are completely different terms in law. "The relationship between the merchant and the child model is generally defined as 'cooperation' rather than 'employment' which abides by the Labor Law," said Tang, a lawyer with abundant experience in minors protection, in an interview with NBD. Despite people's empathy on child models who work for long hours and under discomfortable environment , the kids wear market needs those cute and innocent models to increase sales. "I opened a franchised store of a well-known kids wear brand two years ago in a second-tier city in Sichuan province. The monthly turnover is around 60,000 yuan now", YY (alias) spoke to NBD. "Post-80s and post-90s parents don't care much about price but style and color." There witnesses a burgeoning kids wear market in China behind the high income of child models. According to Qianzhan Industry Research Institute, the compound growth rate of kids wear in China reached 9.68 percent from 2013 to 2017 and the rate will remain at around 14 percent in the following three years, higher than that of the menswear and womenswear market. As to the market size, Analysis of Cosmetic Industry in China estimated the kids wear market size to have reached 160 billion yuan in 2018, and to hit 266.5 billion yuan in 2020. The sunrise sector, of course, brings about attractive income for child models. In 2017, a child model named Ye Zumin accepted an interview and revealed his annual salary was up to 800,000 yuan (119,246 U.S. dollars). Being half Serbs and half Chinese, Ye is noted for his handsome look in the modeling circle. When asked how much a child model can earn at most, "5-7 million yuan a year," Ye said in the interview. Should considerable earnings by child models owned by their parents? In China, minors and adults enjoy equal property rights legally and property acquired by minors through profitable acts shall be owned by minors themselves. Judge Wu with 20+ years of trial experience told NBD, "Minors' earned income can be in the custody of their guardians but it should not be arbitrarily assigned to their guardians". What provisions and regulations can be enacted and implemented to create a favorable environment conducive to economic and social development of child modeling market? What can be done to protect child models from being physically and emotionally abused? Clearly, if guardians or other adults beat or scold minors during photographing, they have violated the Law of the People's Republic of China on the Protection of Minors and they may face criminal punishment and even the disqualification as the guardians of the minors in aggravating circumstances. Tang believed "Contract stipulation and social supervision" can protect children in legal economic activities. Merchants can assume certain social obligations to contribute to the well-being of children. 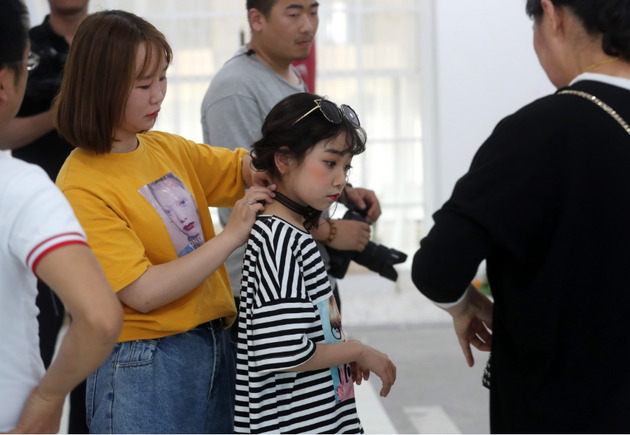 On Thursday, over 100 kids wear shops on Taobao issued a joint statement calling for regulation and oversight of the country’s child modeling industry. Businesses should work together to standardize the procedures for photo shoots involving children, forbid all forms of violence against children, and refuse to use photos or videos if the kids would be at risk of being harmed during shooting, the merchants said. "A scientific and effective legal system holds the key, such as requirements on market access for merchants, child model agencies and other firms, the administrative approval system for child modeling, clear stipulation of workload and working hours, and corresponding punishments", He told NBD in the interview.